Other notable projects Derrick Wyatt has worked on - Ben 10, Mystery Inc, Curious George. 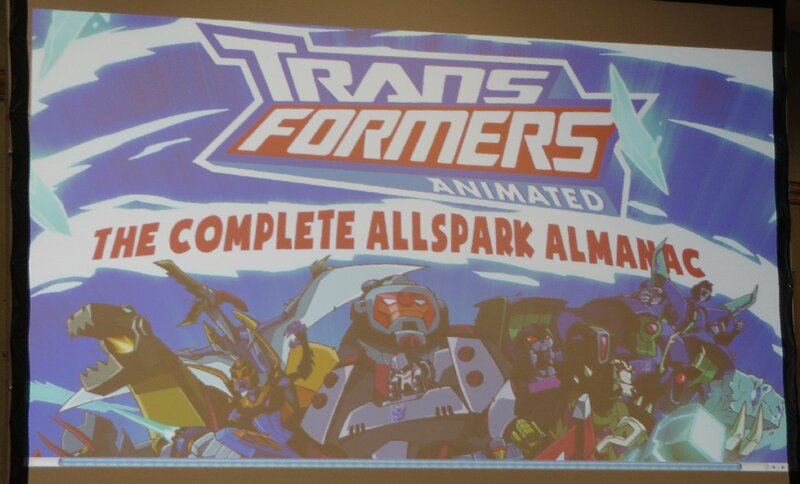 Q&A only... as there wasn't anything "new" to Animated, other than the combined Allspark Almanac book earlier in the year, which they did mention briefly. Reason for giant chins? - makes them look more cartoony and heroic. Purpose or origin of Sari? - it will remain a mystery at this time. Why kill off Blurr? - Cartoon Network wanted Season 3 to go into a darker direction. There were no plans for other Combiners after Devastator (for those who don't know, they were going to have the full set of Constructicons and Devastator, but was scrapped... apparently due to it conflicting with the "secret" plot of the TF2 Movie that same year). Lockdown is apparently an Autobot, so Derrick was really annoyed to see that the new Japanese Adventure toy (out this month) has a giant Decepticon symbol on the chest. He is also not a fan of Bay's Lockdown in the TF4 movie... and had a big rant about it. - The villian "The Headmaster" was going to form his "Masterforce" team of villians with a Targetmaster and a Powermaster. 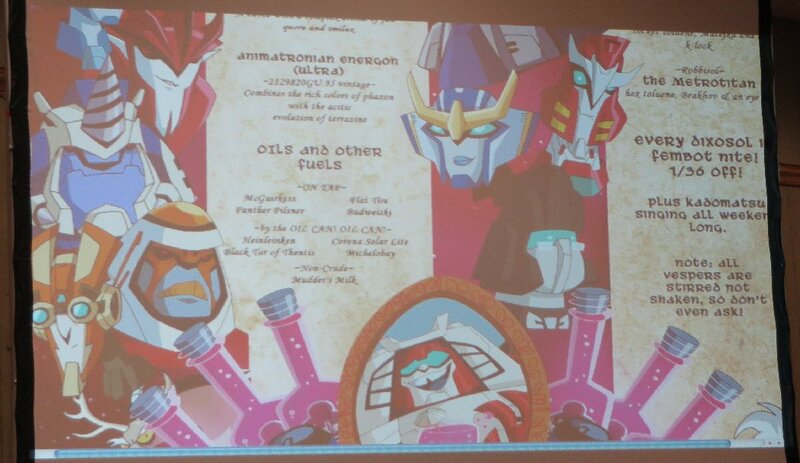 - More Beast Wars characters like Optimus Primal, as the Almanac teased a story of Blackarachnia creating a Beast army. - A story about the Triplechanger process, with a backstory of Blackarachnia's involvement in Blitzwing gaining a third mode... and finding out that a 3rd mode is not good for Transformers (just see what it did to Blitzwing's mind). - Jazz and Ironhide would have joined the main cast. 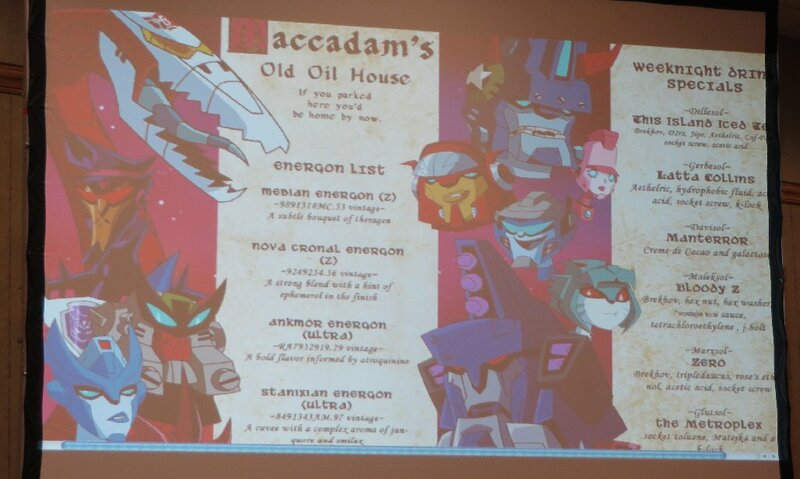 On the left - Skylynx, Barricade, Landshark, Chromia. 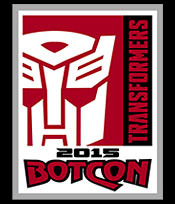 On the right - Autobot X, Blaster, (pink one I missed), Siren, Leozak, Tidalwave. On the left - Knockout, Drillhorn, Cykill, Rung. 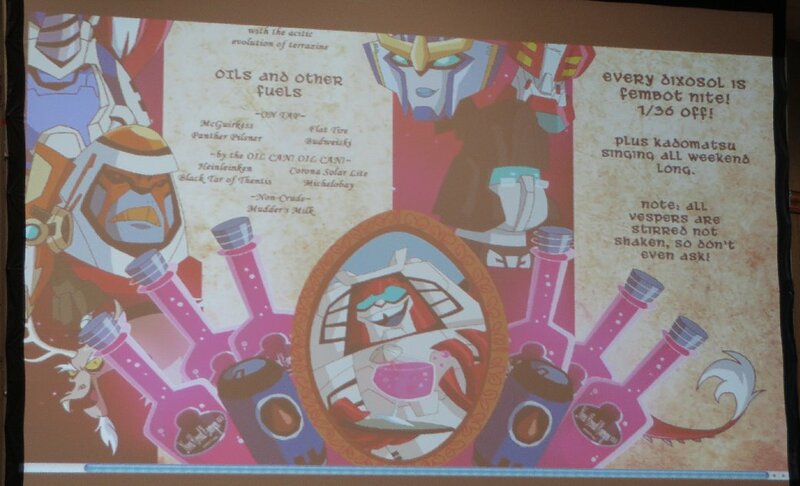 On the right - Pharma, Strongarm, Chromedome. At the bottom - Swerve. Asked about the voice for Perceptor, they noted that they had reached their quota for that episode, so resorted to using that "Stephen Hawkins" type of computer voice.